If you’re one of those people who have already built the habit of exercise, congratulations! Not only you are taking care of your health and wellness much better than the majority of Earth’s population – you are living proof that anyone can do what’s necessary to improve his or her quality of life. 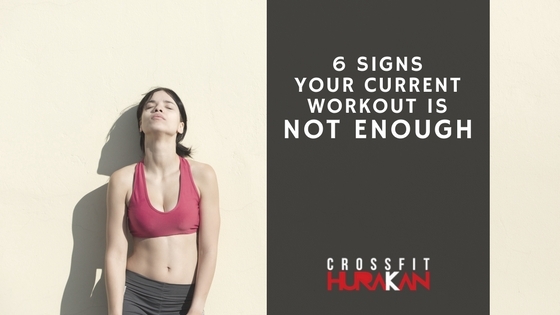 Now it’s time to ask yourself: Is your workout good enough? Is your routine actually moving closer to your goals? You might think: “Yeah, of course! Exercise is exercise, right? I’m pretty sure it is enough!”. If you’re seeing the results you want, you’re probably right! But sometimes we keep doing the same exercise routine for a long time with little to show for it. You barely break any sweat during it. Yes, you’ve walked another block, and, like we say in South America, you feel fresh as a lettuce. It’s very likely the intensity in your routine is too low to activate your body’s energy systems to a point it actually produces any metabolic change, fat loss or aerobic capacity increase. Sweat itself is not an indicator, but a workout should be intense enough to make you require heaps more air than normal as you do it, to the point of almost not being able to talk during the exercise itself. You never feel soreness one or two days after your workout. Probably you felt a bit sore the next morning after you started those brisk walks, but that’s a thing of the past now. Sadly, that’s not a good thing. That only means your body has already adapted to what you have been doing for a while now, and there’s no need for it to progress anymore. Your workout should bring you at least a light amount of soreness at some point afterwards. Obviously we don’t want to feel too sore to move at all, but no soreness at all might indicate we need to lift heavier weights or try to go faster. Your range of motion isn’t improving. Are you able to squat below the parallel line created by your knees yet? Are you getting any closer to it? Are you able to fully flex and extend your arms on a push-up or a pull-up? A comprehensive and effective fitness program should be helping you to improve your mobility, which is key not only for weight loss and strength gains, but for daily life performance as well. You are not getting stronger. Remember than by “stronger” we don’t necessarily mean “more muscular” – we mean being able to lift and move heavier objects (or being able to open those pesky jars ?). If your workout is good enough, you should be able to do daily activities that require strength much easier than when you just started training, like lifting your kid from the ground, or carrying all your grocery bags in just one trip! You are not getting any faster. Still struggling to catch that tram or train during peak hours? Increased speed should be a direct result of your training. Good workouts reward you in the long run with better aerobic capacity to do more reps or distance in less time. You are losing very little body fat, if any. Again let’s assume your nutrition is optimal. You train and train, but you don’t see your waist getting any smaller. A good workout paired with proper eating should get you leaner. Sometimes that’s the case when you start walking or jogging, but when you hit a plateau you should know it’s time to change things a bit. How do you fix all this? Easy! Find a workout program where you can see and feel progress as it happens! For decades CrossFit has already been delivering a methodology that covers all these bases – Intensity, adaptation, mobility, strength, speed and weight loss. Feel free to drop by our gym for a free session to find out if your training is as good as it can be. Julio Gutierrez is the founder and head coach at CrossFit Hurakan. He likes Pop Culture almost as much as he loves the deadlift. Book your FREE intro class at CrossFit Hurakan today!